A former junior champion at Wimbledon in 2011, Ashleigh Barty made her WTA main draw debut as WC at 2012 Hobart (l. Mattek‐Sands in 1r). She won her first WTA title of any kind in doubles at 2013 Birmingham. That year she advanced to three Grand Slam doubles finals in 2013 (Australian Open, Wimbledon, US Open) with her longtime friend Casey Dellacqua. In 2015, Barty earned a contract with the Brisbane Heat for the inaugural Women's Big Bash League (cricket) before returning to tennis in 2016. Her comeback was hindered by a right arm injury sustained in August, after a quarter-final in Nottingham (as qualifier, l. eventual champion Ka.Pliskova). She ended the season at WTA 125K Series event in Taipei in November, reaching the quarter-final. In 2017 she posted her best result at a Grand Slam event, reaching the R32 at Australian Open, falling to Barthel in three sets. The Australian landed her first WTA career singles title in Kuala Lumpur in February becoming one of three players to complete singles‐doubles sweep at same tournament during the year. During the grass court season, Barty became the first Australian woman to reach the title match in Birmingham since Jenny Byrne in 1992 (l. Schultz). She scored maiden Top 10 win in Cincinnati and made the third final of season at Wuhan Open where she defeated four Top 15 players (No.7 Konta, No.13 A.Radwanska, No.4 Ka.Pliskova and No.10 Ostapenko) en route to the final (l. Garcia). She made her debut at the WTA Finals in singles and finished the year with a semifinal-run in Zhuhai as she broke into Top 20 for first time overtaking Gavrilova to become new Australian No.1 in the year-end ranking. Barty began the 2018 finishing as a runner-up in Sydney, losing to Kerber. 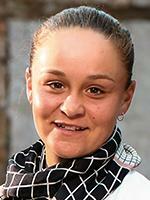 After reaching the third round at Australian Open (l. Osaka), she posted her career-high No.16 on January 29. She made the second round in Indian Wells and the round 16 in Miami (l. Svitolina) where she won the doubles event (with Vandeweghe, d.
Krejcikova/Siniakova). She opened the clay court season with a round 16 exit in Charleston, but won just one match between Madrid and Rome in singles. She enjoyed a semifinal run in Strasbourg (l. eventual champion Pavlyuchenkova via retirement with back injury), but lost to to Serena Williams at Roland Garros in the second round. Barty finished the grass court season with WTA-leading 12 wins, as she won the second career title in Nottingham (d. Konta), claimed the quarterfinals in Eastbourne (l. eventual champion Wozniacki), the round 16 in Birmingham (l. Goerges) and the third round at Wimbledon (l. Kasatkina). In North America, she reached her fourth semifinal of the season in Montréal and made the round 16 in Cincinnati. She also advanced to the fourth round at US Open (l. Karolina Pliskova), her deepest run to date at a major. The highlight of the Asian swing was the semifinals run in Wuhan (l. eventual champion Sabalenka). En route, she defeated No.3 Kerber in the round 16, marking the best win-by-ranking of her career. She partnered Vandeweghe to reach the semifinals in doubles at WTA Finals Singapore (l. eventual champions Babos/Mladenovic). In Zhuhai, making her second appearance at the WTA Elite Trophy, she clinched the third title of her career as she scored her fifth Top 20 win of 2018 over No.14 Goerges in the semifinals and defeated Qiang Wang in the final to seal the 46th tour-level victory of the season. Ashleigh Barty writes Fed Cup history as the first player with..
Fed Cup: Ashleigh Barty sends Australia into the first final since 1993!